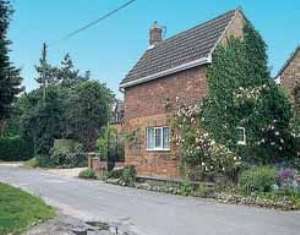 This comfortable and attractive village cottage, retains some beamed character and exposed woodwork. There is a small patio and garden, with access to a further large lawned area to the rear - where children can play. Super walks from the door. An easy drive leads to resorts, beaches and bird reserves. May be booked with property 11584 nearby to accommodate the larger family party. Shop and pub 1 mile. Ground floor: Step down to beamed lounge, dining area open to fitted kitchen, bathroom with shower over bath, toilet & basin. First floor: 2 bedrooms - 1 compact double, 1 bunks (more suited to children). Services: CH by elec NSH. Plus extra elec panel heaters. Open fire. All bed linen inc. Towel hire. Fuel20pw payable to owner. Parking for 2 cars. Cot & h/chair on request. Freeview TV. Video. DVD player. Stereo/CD. M/wave. Industrial w/machine & t/dryer in shared utility room. Separate open lawned garden with furniture. BBQ. Pets welcome.